We love hearing from you and encourage comments. We read each and every comment we get and hope to build a community with this blog. However, comments deemed negative, inappropriate, or rude will be deleted. We do our absolute best to credit images found from other sources. If you find an image to be (unintentionally) missing a link or not properly credited, please email us at sunnydaysandstarrynights@gmail.com so we can correct it. If you would like your photo or work removed from a post please let us know via email so we can promptly correct the issue. Whenever a company has paid to be featured on this site, a note identifying the content as sponsored will appear within the post or at the end of the post content. We will always disclose when something was given to us for free, or when we were paid to write about it. Any products that have been gifted to us for review shall be noted with "c/o" or "gifted" at the bottom of the post. 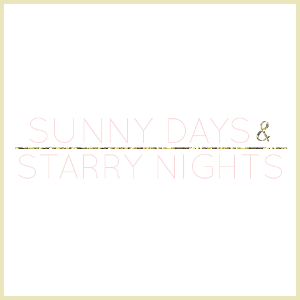 Sunny Days & Starry Nights is part of the affiliate marketing networks RewardStyle, ShopSense, and Amazon Affiliates. By clicking and/or purchasing items via certain links on this site and across related social media platforms, we may receive a small (very small) commission. Every item contained in content on this blog reflect our personal style and preference. We will only share things we like and would choose to post regardless of commission potential. As always, if you have any questions, please feel free to email us at sunnydaysandstarrynights@gmail.com.